Ziki Questi's Blog: Flashmans Nouveau! 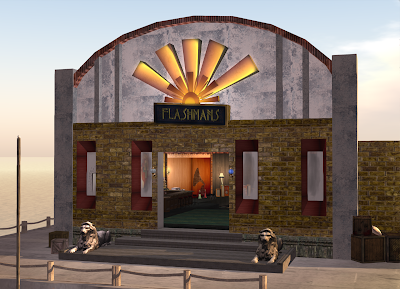 If you know me, you know my love of Flashmans, the legendary watering hole where the most curious of Second Life would gather. 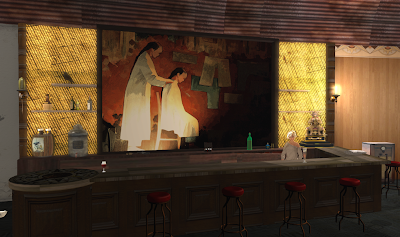 They were interested in art for art's sake, in witticism, in obscure literary references, in oddities, in opium and absinthe, in misfits, in two-headed calves, in dancing, in urinating on the bar, in inebriation, and certainly in camaraderie. Originally a magnificently seedy bar built by the brilliant Martin Ren, the first Flashmans eventually closed, only to reopen in a new location, and then close again, then reopen yet again for a third time (more as a dance hall sort of place), only to eventually close, and now the old girl is giving it a fourth whirl on the dance floor with the opening of Flashmans Nouveau. One caveat: Flashmans is now on a homestead, so 20 is about tops for avatars. It's a no-no to leave your fanny parked at the bar while you go afk, but come and have a good time!